another challenge - valerie-aebischers Webseite! It all started some months ago, when I had some pain in my knee. I haven't been thinking about it, continued with my training. After the European Champs it got worse and for the first time I had some troubles during trainings and competitions. So I decided to do a 2 weeks running break. Afterwards we went to a trainings camp with the national team and thanks to a great physiosupport during this week, my knee was recovering (I thought so) and I could run some good trainings. Because it got that much better only with physiotherapy I just continued with it back home. And it seemed to be working. I was happy and relieved. No problem for the Students World Championships WUOC! On a Saturday in July we had our flight to Finland for WUOC and I went for a short and easy run in the morning. Absolutely no pain for the first time since some weeks! But then, when I wanted to step out of the shower I felt a very strange blockade, I wasn't able to bend the knee. No pain, just resistance. During the day and the travel it got worse and swollen and I was a bit nervous. Still, I could do good preparation trainings and our team physio did a good job, so that it was no problem to run my races at WUOC. But all the time there was that very strange limitation of range of motion. And then, suddenly and I don't know how this could happen, the limitation was gone but instead there was a little piece in my knee, which I could move with my fingers. This was the moment, when I was really getting afraid and I realized, that I definitely have to check this. 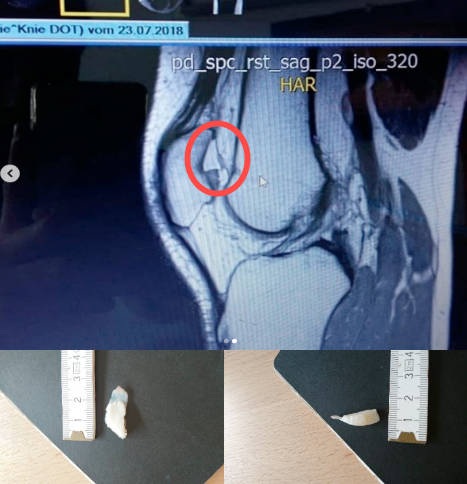 Because it is only cartilage without bone, there is no chance to refixing it and a week ago I had the first surgery where this piece was removed. I really want to try to come back to elite sports and therefore there is only one solution for the next procedure. We have to try the ACT, an autologous chondrocyte transplantation. Therefore, they will take a little bit of cartilage with cells out and send it to the laboratory, where the cells are cultured for 4 weeks. Then they will be injected into the damaged area. And then, the really hard time is going to begin. For 12 weeks I will have to gradually increase the weight on the operated leg until full weight and once this is reached, I can start with some easy trainings again. But I have to stay away from running and intensive trainings for around 12 months. If I wont't be doing ACT, the risk of more broken pieces and especially of damaging the other side, so the cartilage of the femur, is very high and once this did happen, it will get very very complicated and competitive sports will be very difficult to reach again. For me as an elite athlete this is a really hard piece that is coming now and I'm aware, that it will be very difficult sometimes. But it's in my own hands how difficult it will be, so I'm trying to stay positive, to see the world from another side and especially to be aware, that it could be much worse and that there are people with bigger problems. And it's not only bad to be in this situation, already now I did realize, that all the thoughts I had about my career and if I should go on with elite sports, are gone. I really want to do competitive sports and to fight during hurting trainings, I want to find out my limits and to push them. I'm looking forward to my coming back and I will do everything to make it happen!